Nina Song Yi Kim was born in Houston, Texas. She is an extremely skilled gymnast with potential to be a huge success. Nina began gymnastics when she was seven years old. From the beginning it was clear that Nina had talent.. Nina began gymnastics because she saw a girl doing some cartwheels and she started doing them too. Nina's mom signed her up for gymnastics soon after she discovered her daughters hidden talent. Nina trains hard nearly every day, for almost fourty hours a week. She spent a long perioid of her gymnastics career training at Brown's Mega Gym in Houston, and now trains almost every day at WOGA in Plano, Texas. Nina is a dedicated gymnast who follows her own personal motto, "don't quit" to the point. Nina wakes early hours to train at her gym and is usually enthusiastic about it. Nina's talent will take her far, as she is already a member of the U.S. International Team. 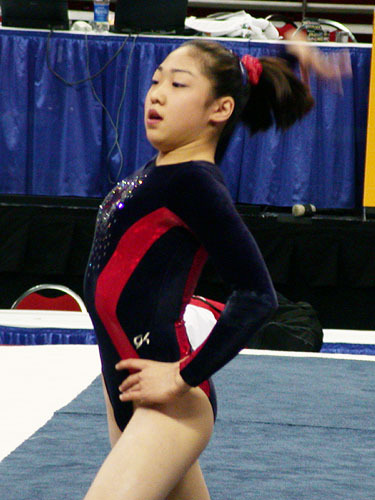 In March of 2002, Nina made the transition to her current gym, World Olympic Gymnastic Academy, commonly known as WOGA. She continues to be a dedicated athlete and hopes to continue to succeed. Whenever Nina has any free time (though she describes her day as mainly waking up, going to the gym, and coming back home) she enjoys swimming, going to the mall, and riding the bike. She is also a fan of Britney Spears, N Sync, BBMak, House of Blues, BSB, Christina Aguilera, 98* Degrees. Despite her common interests, Nina is certainly not an average teenager. In fact, she barely has any time to relax. Nina's dedication has already been displayed and she most definitely will continue to be successful in the future. Goodluck in all of your endeavors, Nina!